Philosophy takes the tone of the art that inspires it. The turn of a sound or a line or a phrase gives the trajectory for our minds, the flow of our thoughts as well as our desires. The analogy or allegory is often the first move in philosophy. The garden hose analogy is an attempt to give context to the question: what do you think, and why? The mind is a garden hose in our hand. For some, life demands (or comes with) a one of those pistol-gripped regulators. But others just have our fingers to shove clumsily over the spout. We can’t stop or hone the flow–whatever we direct our eyes on to drench, water will invariably squeeze out the sides. All moisture is equal to life. Fanned out from our thumb–as if in fairness–the flow is not enough to grow fruit–but things close will live. Wild flowers grow fine under clumsy hand. Weeds are as green as grass. When the stream shoots strong and far, only the mist feeds the lawn we stand on—sometimes only with sliding drops. The flowers and fruit we aim must remain at arm’s length—when close, the strong stream bites, bores, and tears. Without manipulation, the stream feeds only what we stand on. Stopping the flow ends our dream of flowers, as well as the mud swelling up beneath our toes. 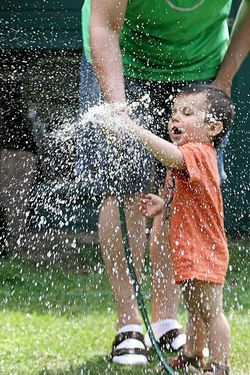 Drinking from the hose is generally safe, but thought to be toxic. We may need other flows to sustain the hand. This entry was posted in Blaise Pascal, existentialist, perplexity, philosophy, questions, Religion, skepticism, theology, Uncategorized and tagged amateur philosophy, brains, existentialism, gardening, gardens, hoses, philosophy of mind, self-help. Bookmark the permalink. It is lovely to see a thinker. My soul feels just a little more at home here on this earth when I find other souls’ open and searching. Thanks Serene. It does feel nice.